This one's for Dave Stuckey! 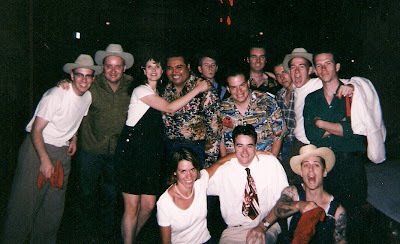 We hit the road in 1998 to do a little west coast tour with the Hot Club of Cowtown. This pic was taken outside of Tio Leo's in San Diego after the show. A few days later we made our way up to San Francisco where we played at Cafe du Nord. Here's what we sounded like on July 3, 1998.